Isn’t it funny how being ill causes many of us to enter a time capsule and revert to when we were kids? I know when I’m hit with the flu or a tummy bug, the nine- year old in me comes out in all her whingy glory and I find myself craving mummy-style pampering, lots of hugs and comfort food. When I was ten years old, I got the chicken pox and had to have two weeks off school (devastating, I know). My mother stayed home from work as well to look after me and it’s only now when I have a career of my own that I appreciate the difficulty of taking so much time off with zero notice. So for two weeks we hung out at home watching videos on the VCR (showing my age now) and playing game after game of Monopoly, me slathered in calamine lotion and mum doing all she could to distract me from scratching the pox. I gained a true obsession appreciation for the game, becoming some sort of speckly real estate mogul of a cardboard and plastic world. And mum kept the comfort food coming. A sore throat was a feature of my chicken pox so she would make a lovely, seasoned and buttery mashed potato which she would form into little round cakes lovingly pressed with a fork to make them a little bit fancy. I lived on these simple little potato cakes until my throat recovered and I could stand to eat other foods. Slowly, the pox dried up and I was given the all-clear to return to school. I know we were both a little sad to put aside the Monopoly board, leave behind the mother-daughter pseudo holiday and return to our respective vocations. Over the past few days when I was hit with the flu, comfort food was again what I craved. And at the top of the list of warm flu-busting foods for me is Dhal, that simply flavoured lentil soup that is on every Indian menu. Not the buttery, garlicky stuff you get in restaurants but a simple yellow dhal, the kind that is made in Indian homes all over the world on a daily basis. This dish is one of the first Indian recipes I learned, when I was young and restless and would only stand still in my mum’s kitchen long enough to learn something this simple. 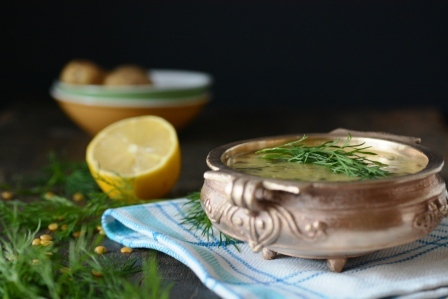 It is still made fairly frequently in our home, and often we will stray from the basic recipe to throw in some frozen peas, a couple of handfuls of baby spinach, chopped onion or diced potato. I could eat bowlfuls of this stuff as a soup or mix it with rice the traditional way with a side of curry and yoghurt. Ask ten Indian women how they make their yellow dhal and you are likely to end up with ten different recipes. 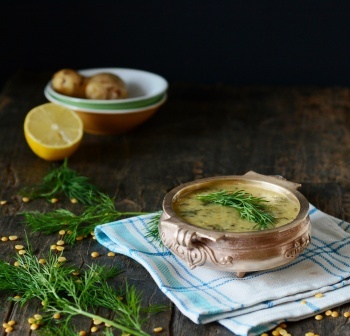 This is the way my mum and I make it- a little gingery, a little lemony, a little herby and a lot comforting. Cook Dhal however you are used to doing so. I use a pressure cooker. I place the dhal in the cooker with 1 1/2 cups boiling water and a good pinch of salt. With my cooker, the dhal is cooked after 3 whistles but you will have to adapt this according to the cooker you use. Another option is to soak the dhal overnight, then either boil it with 1 1/2- 2 cups water in a saucepan with a tight-fitting lid, or use a rice cooker. You should be able to use a microwave as well but I have never used this method. Once the dhal is cooked, add a further 1/2 cup water, 1/2 tsp salt, the ginger and the chillies. Transfer the whole mixture to a saucepan or pot. Simmer on low heat for 10-15 mins, stirring intermittently. Ensure you break up any lumps in the cooked dhal when you stir. Add the herbs and simmer for a further 2 mins. Turn off the heat and add the lemon juice, stir through. Taste and add a little more salt or lemon according to taste. In a separate small pan, heat 1 tsp oil. Add the cumin seeds and turn off the heat. Once the cumin seeds have all popped, add the asafoetida and curry leaves. When the curry leaves have semi-browned in the oil, add the tempered mixture to the dhal and stir through. Serve with rice, chapatis or on it’s own. Asafoetida is the dried and powdered gum exuded by certain underground rhizomes and an important ingredient in Indian vegetarian cooking. It has a pungent smell and helps to balance flavours as well as aids digestion. You can get Toor Dhal and asafoetida at Indian Grocery stores. Toor Dhal is also available in some supermarkets. 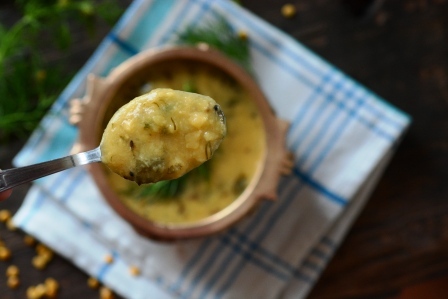 The pressure cooker method is the easiest way to cook dhal. If using a pressure cooker, allow it to cool completely before trying to remove the lid. If using the other methods, soak overnight first and ensure the dhal is cooked through before using- this will take a good 30-40 mins on the stove. I know, it’s totally the cure for the common cold. Sending big hug your way for speedy recovery! 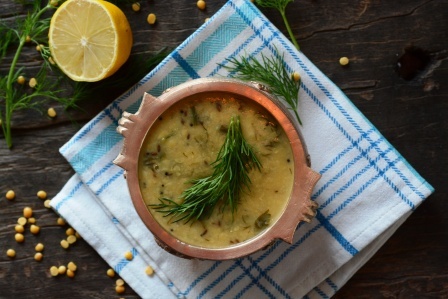 Ginger, lemon, cumin, dry red chillies — they make my dal world go round.. From one die-hard dal-lover to another, this is awesome.. Ive never tries dill in dal, going to give it a go! I know, it’s truly one of those simple and addictive pleasures. And unlike other addictions it’s healthy. 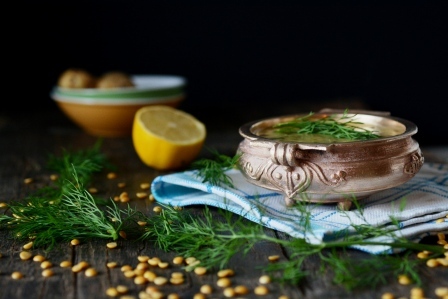 Actually the Dill is the only variation on my mum’s version and was adopted from V and my MIL…..you should give it a go! Ahhhh! I love daal. I agree that ten different Indians will have 10 different daal recipes. This one is fairly closer to mine (basically my mom’s). She does do a little additional thing. Before putting the lid on the pressure cooker she allows the dal to boil a little which forms a lot of foam on top. She removes the foam by scraping it off with a ladle. Her logic: this is what used to happen when dal wasn’t cooked in pressure cookers. The foam would just fall off the sides of the pateelas (pots) with the first boil. We must manually do it now. Its difficult to put a finger on it, but I do feel the difference in the dal with foam-without it. I think removing the foam makes the final dal smoother. Or maybe its just in my head. P.S. – Beautiful pictures again. I love how you include the raw ingredients in the frame. The sprinked yellow lentils look so beautiful. Great tip Aditi! I must try it! Thanks for the kind words re the photos.